We only use our own trusted removable vinyl for point of sale applications. This means you save time (and money) when the valetors/sales apprentices remove the graphics! No residue stays on the car, you could remove the graphics and hand over the vehicle in no time at all. Most point of sale graphics are digitally printed. You can have almost any colour or texture on this earth. Generally we print these with a white outline as well. So if you sell the originally chosen car, the graphics can be fitted to any colour vehicle. We know it’s going to be last minute, or time sensitive and were ready up for it. DPD comes to our door every day and collects graphics to be shipped out throughout the country. And our mobile fitting teams have set routes over the south coast to ensure weekly coverage. All of our dealership signage is bespoke. We understand that identity is everything, and pride ourselves with our ability to provide all of our dealerships with unique designs. 90% of our Point of Sale signs are digitally printed, allowing for total freedom of colours, textures, and styles. All of your designs will be kept on file, ready to be re-manufactured pending vehicle delivery dates and new vehicle contracts. Additionally, bespoke design templates can be set up, allowing you to call or email with pricing figures which we can convert quickly into eye-catching signage to apply to your vehicle. Point of Sale Decals refers to short-term removable signage applied to a wide variety of surfaces. 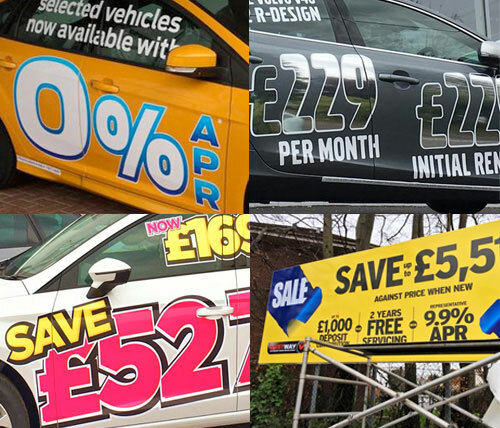 From special offers on salon windows to ‘was/now/save’ decals applied to new car sales, we can create a bespoke message and graphic to suit your individual requirements. Depending on the surface and message, we will suggest the best possible way of designing, manufacturing, and fitting the decals. All of our vehicle marketing decals (unless requested otherwise) are printed and manufactured on short-term removable signage with a lifetime of up to 3 years. 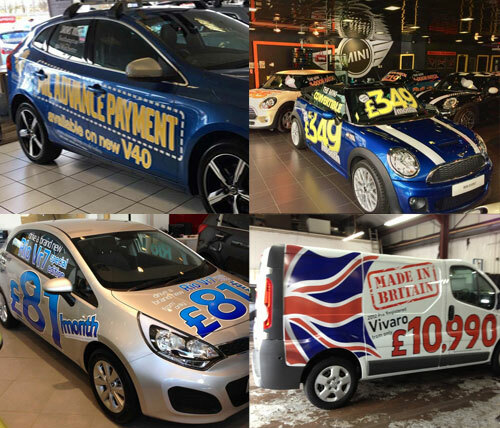 Our vehicle marketing decals have proven to be a massive success throughout the South Coast. We have worked closely with the motor trade for years and are quite well rehearsed in keeping designs within the realms of brands. Our team is full of experienced graphic designer with a wealth of background in marketing & dealing with brands across the South Coast. We’ve learned many of our customers’ working process so we can fit within their schedule. Get in touch to see how we can help your brand.